I’m sure you’ve heard of butter chicken, right? 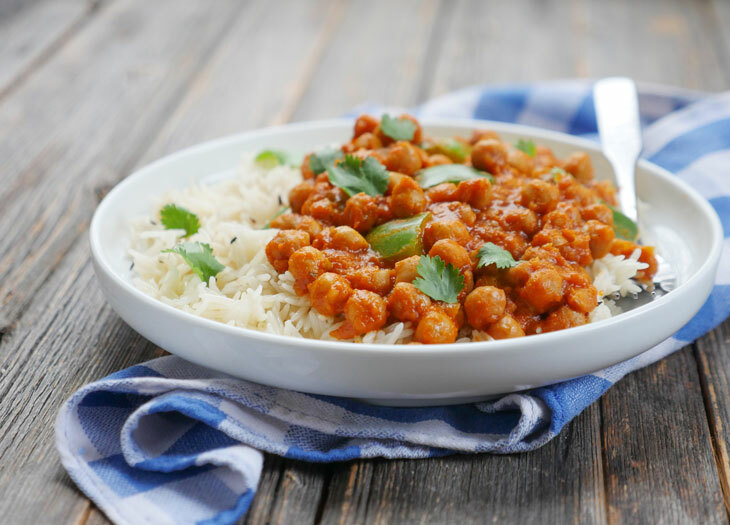 Well this instant pot butter chickpea curry recipe has all the butter chicken flavor minus the actual chicken! I’m telling you guys, this tastes absolutely decadent! This dish is rich and hearty and after eating just a few spoonfuls, you’ll start to feel all warm and cozy inside. Yes, it is the perfect dish for the vegans and vegetarians in your life and it’s also the perfect dish for meat-eaters looking to switch things up. Make this on a meatless Monday or really any day of the week. Do I need to Soak the Dried Chickpeas Overnight? My recipe calls for dried chickpeas, making this dish extremely economical. 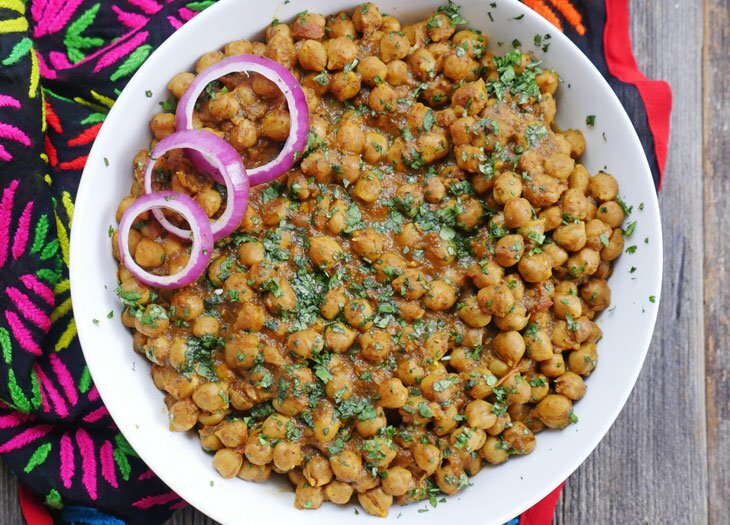 With an Instant Pot, this dish takes a fraction of the time it’d take to make this on the stovetop and cooking this dish in an electric pressure cooker really infuses the chickpeas with a ton of flavor. I know there’s always a lot of disagreement over whether or not to soak legumes but I think most Indian families (or at least the ones I know) soak beans/legumes prior to cooking. That’s what I do because that’s what my mom taught me and that’s what my grandmother taught her. I think it makes them easier to digest. You do you – but know that if you’re not using pre-soaked beans then you may need to cook the chickpeas for longer than the recipe calls for. My method results in perfectly soft and tender chickpeas. What if I Forget to Soak the Chickpeas? How Can I Do a Quick Soak? You either need to soak the dried chickpeas overnight OR do a quick soak. The amount of water listed in my recipe is what’s needed for soaked chickpeas. Dried chickpeas absorb a lot of water so if you don’t soak them in advance, the proportion of chickpeas to water will not be correct. Also, I believe that soaking legumes helps them to be more easily digested. Did you forget to soak the dried chickpeas overnight? You can easily do a quick soak by covering the dried chickpeas with an inch of water and pressure cooking them for 10 minutes with a natural release. Then dump out the water, rinse the chickpeas well and follow the directions for butter chickpeas from there. 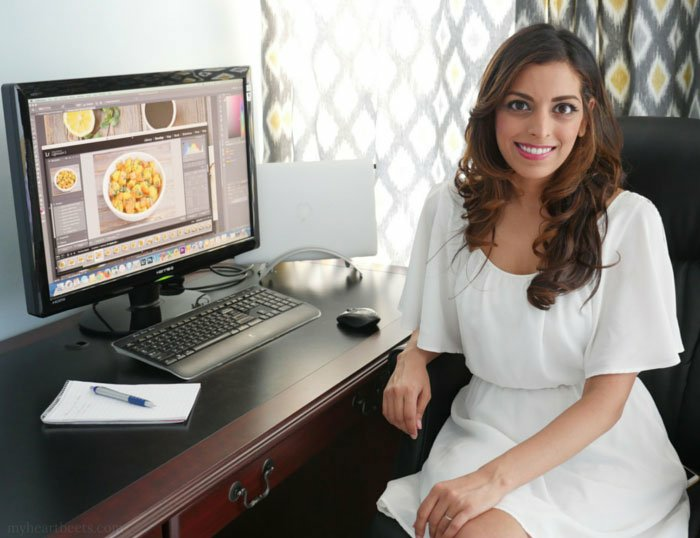 If you’ve tried my Instant Pot Butter Chicken before, then you will love this recipe. And if you haven’t tried it because you don’t eat meat, now you can – well, the vegan version which is honestly just as good! Press the sauté button. Add the oil and allow it to heat it up for a minute. Add the onion and stir-fry for 6-7 minutes, or until the onion begins to brown. Add the garlic, ginger and spices stir, then add the chickpeas, tomato sauce and water. Add the bell pepper, cream and fenugreek leaves to the pot and mix well. If you are not vegan, then feel free to use ghee instead of oil and heavy cream instead of coconut milk! Like this recipe? 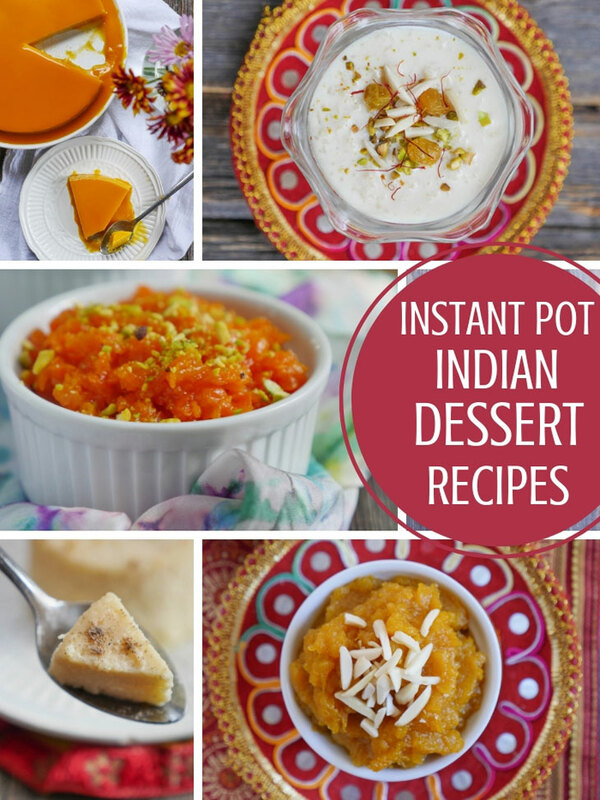 You can find all of my Indian Instant Pot Recipes right here on the blog! Could canned chick peas be used instead of dried? Hi Ashley, planning to try this using canned chickpeas. With this modification, should we cook the tomato, onion and masalas for 5 – 6min under pressure in IP and then QR and add the canned chickpeas and pressure cook another 1 – 2 mins? Should we QR/NPR after the last step? Hi Smita, if you’re using canned chickpeas then I’d add them in step 3. A 5 minute cook time will work just fine since the canned chickpeas are already cooked. You will want to use less water too – dried chickpeas absorb water when cooking but since you’re using canned chickpeas that won’t be the case. You can also let it NPR to try and infuse more flavor (though QR will work too!). Let me know how it goes! yummy- but you need 2x19oz cans of chickpeas. This is such a great recipe! I love that it doesn’t use dairy, but you still have the creaminess from the coconut milk! So quick and easy to make! I just made this last night. So delicious! My kids loved it too. I used heavy cream instead of coconut cream. Thank you for all of the wonderful recipes! Yes definitely – the coconut oil may add a slight coconut flavor to the dish as long as you’re okay with that! I absolutely ADORE Indian food. 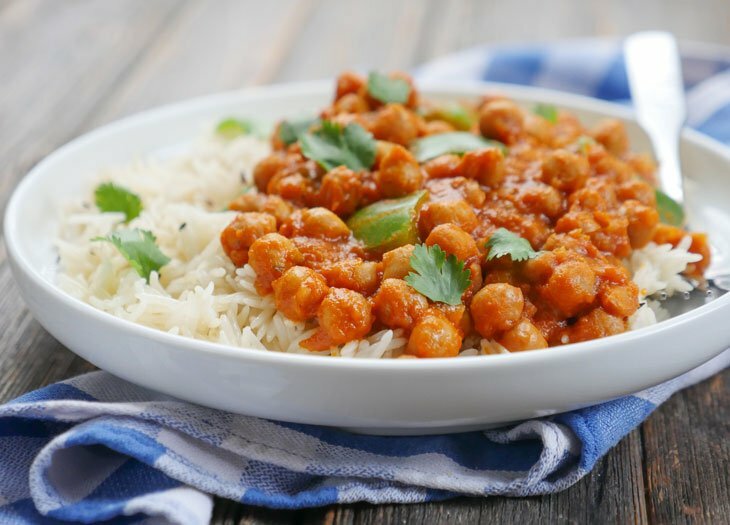 I’m really hoping there are ways to make these traditional and savory dishes like Butter Chicken and Butter Channa WITHOUT tomatoes…do you think it’s possible? I’m going to try the AIP (Auto-Immune Protocol) diet, which forbids Nightshades including potatoes, tomatoes, eggplant, etc. Funnily enough, your blog was linked from a Paleo/AIP web site as a recommended source! Hi Amy! 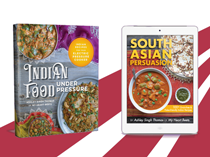 I’m not sure if it would be possible to make these dishes without tomatoes… are you in my Indian Instant Pot group on facebook? You may want to ask there – hopefully someone else following an AIP diet can help! Hi! I’m trying to be more vegetarian this year and also cook more (now that I have an IP woo!). How would this dish differ from chana masala? Can’t wait to give this a try! looks delicious! Hi Joanna! 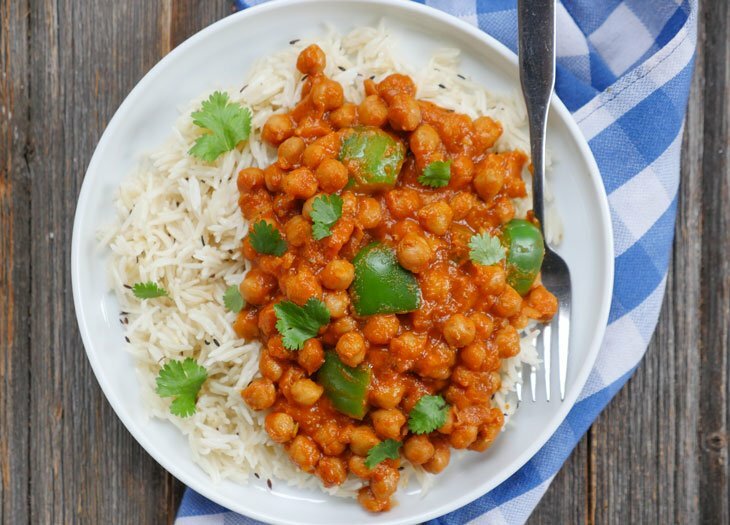 Chana masala has a very different flavor – this dish tastes more like butter chicken but without the chicken. Do you have my cookbook? If so, I have an excellent recipe for chana masala (also known as chole) in there! This was delicious! Thank you for another great recipe!! 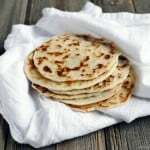 Hi Ashley, can I use kala channa instead if garbanzo . Will the cook time change? 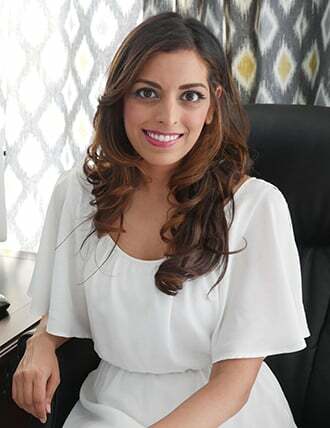 Hi Shoba! I haven’t tried this using kala chana but I have a feeling it’ll be great in this – I would change the cook time to 45 minutes. Please let me know how this turns out for you! Could you add rice into the IP? if so when? Raleigh, I’m not sure this will work as a good pot-in-pot dish because chickpeas take a lot longer to cook than rice does. 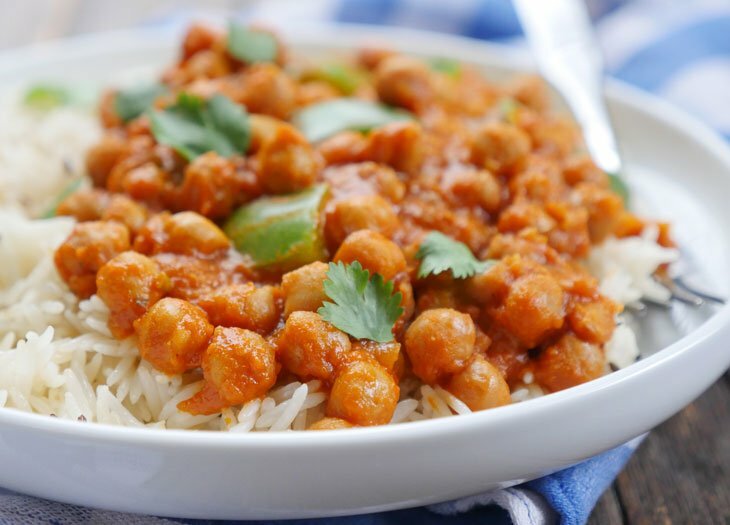 If you were going to give it a try though then maybe try it with brown basmati rice – since it’ll be above the chickpeas it will take longer to cook and might actually work. If I give this a try I will update the post – let me know if you try as well! 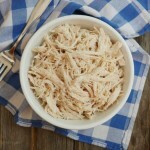 Ashley, I made this recipe last week and loved it! I want to double it now. Do I need to adjust the pressure cooking time? Vic, that’s so great to hear! You can leave the cook time the same 🙂 Because the pot will have more in it, you’ll likely notice that it’ll take longer to build pressure and it will also take longer to release pressure. Hope that helps! Hi! Thank you 🙂 I can’t wait to try this recipe. Do you think it will be ok to make this recipe oil free? Hi Fareen! I think you will need oil to sauté the onions – unless you have a nonstick pot. Let me know how this works out for you! We typically use a mix of veggie broth and water, by the teaspoon, to sauté onions. The dry spices won’t toast as well, but it’s a trade off. Or you could try aquafaba, which is the liquid from cooked or canned beans. While trying to eat healthier, I sometimes make this recipe for myself at the start of the week and make portions for myself for each lunch. I love it! How many servings would you say this makes? Georgia, that’s great to hear! It really depends on what else you serve it with but my guess is 4-6? Delicious!! Do you think there’s an easy way to add potatoes or cauliflower to it? Hi Amy, due to the long cook time the only way to add potatoes and cauliflower would be once it’s done. I would cut the potatoes into very small pieces and leave the cauliflower in big chunks then try pressure cooking for 2 minutes (I normally do 4 minutes for 1-inch potato pieces but that would turn the cauliflower to mush). I hope that works – let me know! Thank you – I’ll give that a try! Hi Ashley. 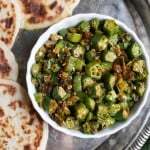 Can I make this recipe with the onion masala. How much of that masala would I need to use? I’m planning to try this in the instant pot and 35 minutes seems long for soaked chickpeas. Is it that the desired consistency is very soft? I see other cookbooks cook soaked chickpeas for only 12-15 minutes. Also how would you modify this recipe to use your onion masala? Thanks. Hi May, yes, the desired consistency is very soft. You can try it for less time and see how you like it! 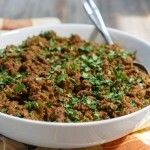 As for onion masala with this recipe, I’m sure you can use it but I haven’t tested the amount. Let me know how this goes for you! Can you use anything else in place of a pressure cooker? I inaugurated my IP Ultra with this recipe. Very tasty all around and approved by all except, my pickiest teenager. Do you think buttermilk would hold up in place of heavy cream? My kids prefer a sour taste vs. sweeter taste of the heavy cream. Happy to hear that! And as for buttermilk, I’m sure that’d taste great too! If they prefer sour, you could also try adding a bit of tamarind paste? Just an idea! Do you think I could use the Onion Masala with this? Yes, I’m sure that will work though I haven’t tested it to know the amount needed. Let us know how it goes! This was so delicious! Highly recommend it! Just a note: If you do not soak the chickpeas ahead of time, increase the water to 4 cups. I forgot to soak mine, and knowing that they would absorb extra water, I increased the amount. 4 cups turned out to be just about perfect. Thanks Ashley for your awesome recipes.Can I use tomatoes instead of canned tomato sauce. Hi Sincy, thanks so much for the kind words! Yes, you can use fresh tomatoes just be sure to sauté them to cook them down (canned tomato sauce is cooked down). Let me know what you think! Oh man, this is delicious. The sauce really does taste like butter chicken sauce. I am about 80% paleo but I eat some smaller legumes sometimes like chickpeas and lentils, so as soon as I saw this I knew I had to make it. To bump up the veggie content I also stirred in 2 cups raw baby spinach and served over cauliflower rice. I will absolutely be making this again. Thank you!! Monique, so happy to hear that you liked it! And I love that you added baby spinach and ate it with cauli rice! I’ve never rated a recipe before but this was SO good, I had to!! We halved the tomato sauce and replaced it with water. We also didn’t have a bell pepper. Still absolutely amazing and 3-year-old approved. Yay! We will have to check out more of your recipes. Thanks for sharing! Does the bell pepper get added raw at the end? Am I missing something? Hi Ian, yes I add it at the end – it’ll soften a bit from the heat but still have some crunch to it. You can also press the sauté button and cook it until it’s tender to your liking. Thanks! This was delicious. I liked the crunch from the bell pepper. Ian, I’m so happy to hear that 🙂 Thanks for letting me know how it turned out for you! 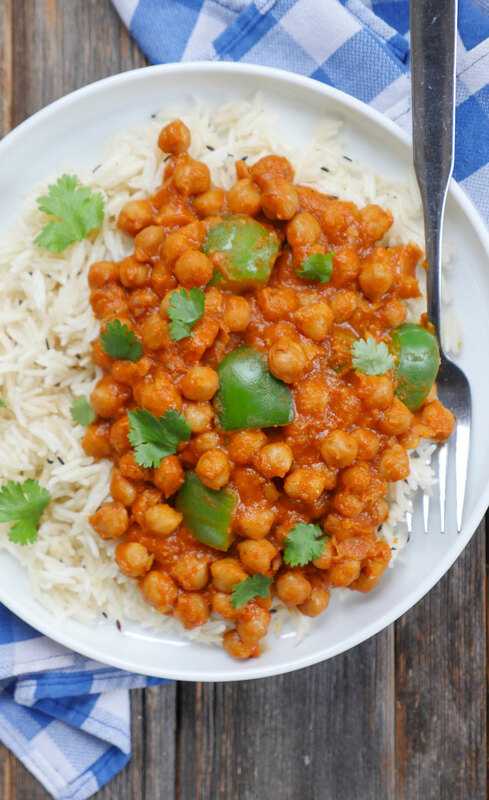 Swati, I’m so happy to hear that you like the butter chickpeas so much – and that you’re enjoying my other recipe! Thanks for letting me know how it turned out for you 🙂 I can’t wait to hear what you think of other recipes that you try! Can I use fresh fenugreek instead of dried? I’m not making it for a few days so I would have time to dry it. Also, I’d to add some additional vegetables- do you think green beans would be good? Hi Mary, fresh fenugreek isn’t as strong in flavor as kasoori methi (dried fenugreek) so it won’t give it the same flavor. As for green beans, I’m sure they’d be good 🙂 The only thing to keep in mind with adding veggies is that you may need to adjust the spices. Hi,thank you for these delicious recipes. 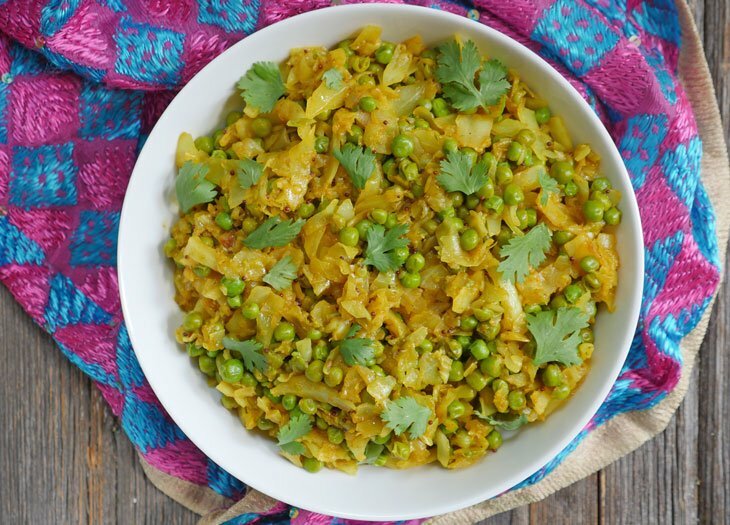 Have you tried making this with your onion masala recipe? This looks lovely! Can I just ask, does it freeze well or might it go mushy when frozen and reheated? Lisa, thank you! It should freeze well – chickpeas usually hold up pretty well 🙂 Hope you enjoy the dish! Another winner! 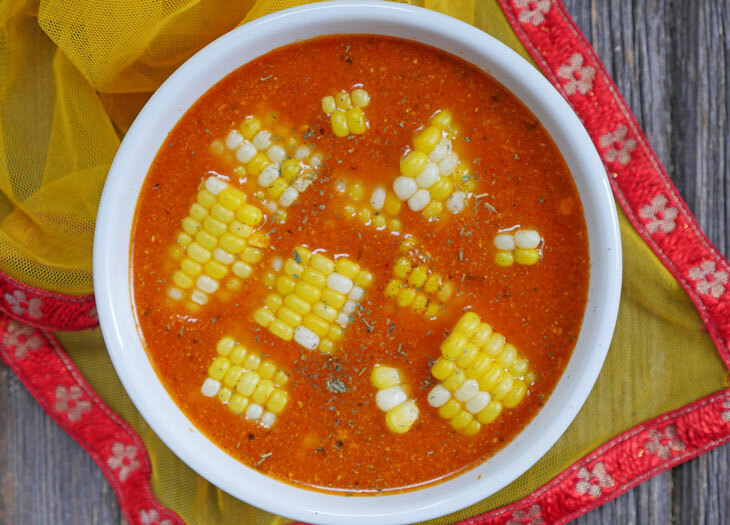 After a long, busy week I was craving something warm, comforting, easy and FAST…and this recipe fit the bill perfectly. I used 3 cans of cooked chickpeas and only about a half cup of water and it turned out perfectly. 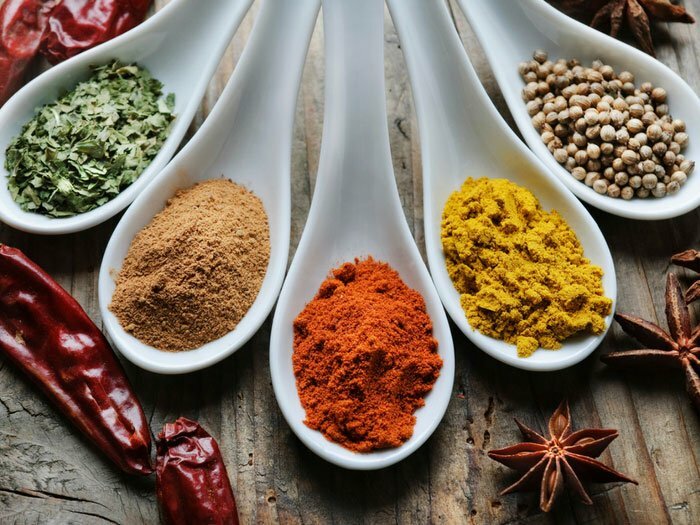 My favorite thing about your recipes (besides how yummy they are) is that they are well-explained and can be made with things that I almost always have on-hand. My confidence in making Indian dishes has increased so much since I started following your recipes because they always turn out great. Keep them coming! Can I add the bell pepper earlier, so that it gets cooked with the rest of the meal? I’m not a fan of raw or raw-ish bell pepper. (If not, I can saute them ahead of time, and then add them in later, but I’m wondering if they can be cooked with the rest) Thanks! What is the minimum soak time for the chickpeas? Thanks! Would this taste just as good with regular cream? My daughter needs to eat 2 oz of both chickpeas and lentils per day for an allergy desensitization program she is going through. It’s a very specific amount so I freeze things in small ball hard to defrost. I have been freezing your mango chicken and seperately adding chickpeas and lentils after defrosted. Do you think the chickpeas in this would freeze and defrost well? I could just stir in lentils once defrosted. Annie, good luck with this!! I hope it all works out 🙂 I think it would be okay – but I’d ask your program if freezing the legumes changes the protein or anything important about it? 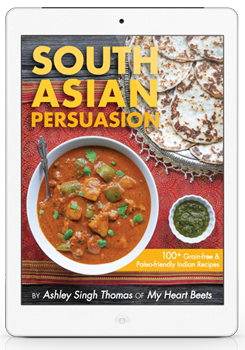 I don’t have fenugreek leaves, is it a huge deal in terms of taste if I don’t add the pinch required?